As if it's already February. January was filled with exam stress and settling back into uni life. It was also my 19th birthday on the 24th and I received some great presents from friends and family. February I hope will be a little more organised than January and I'll hopefully get everything I want to accomplished. I've never been one for monthly favourites but maybe this year will be different. Thanks to one of my housemates, I finally had a diary to get me organised with uni and general life. Unlike usual diaries, you don't have to use this every day; you add the date in yourself and so for days I'm just watching Louis Theroux documentaries, I don't have to feel like I've wasted a page. I also get bored with diaries quite easily but I think the layout of these pages makes it more fun and easy to organise. Each page has a timeline of the day, a to-do list section, objective boxes which I've actually been using to plan my meals and then a notes and doodle section. I think this is a fab alternative for a diary and there are so many different patterns and covers to choose from. While here it makes as a good background prop, since receiving it for Christmas, it has been a staple in my wardrobe. It so soft and cosy and great for the windy weather. Not only that but I love the more beige/pink tartan that it has and it adds something a bit different to other tartan scarves I've had. I'll be continuing to wear this for the rest of winter and spring and then again when Autumn comes around. If you know me, you know I'm not a massive lip gloss fan but I think I may be converted. This lipgloss gives me such an hydrated look and paired with a pale lipstick, it's a winning combo. With a quite overwhelming tingling feeling to the lips, they are plump and full with just a coat of this. While lip gloss is something you have to reapply quite often, I've found it leaves my lips hydrated and plump even after it's worn off. This small version came inside the suitcase bundle they brought out at christmas; if I ever run out I would highly consider repurchasing the full size. Another from the suitcase was this face wash which I've been dying to give a go for ages. It smells so nice and leaves me with soft skin and the perfect base for makeup. 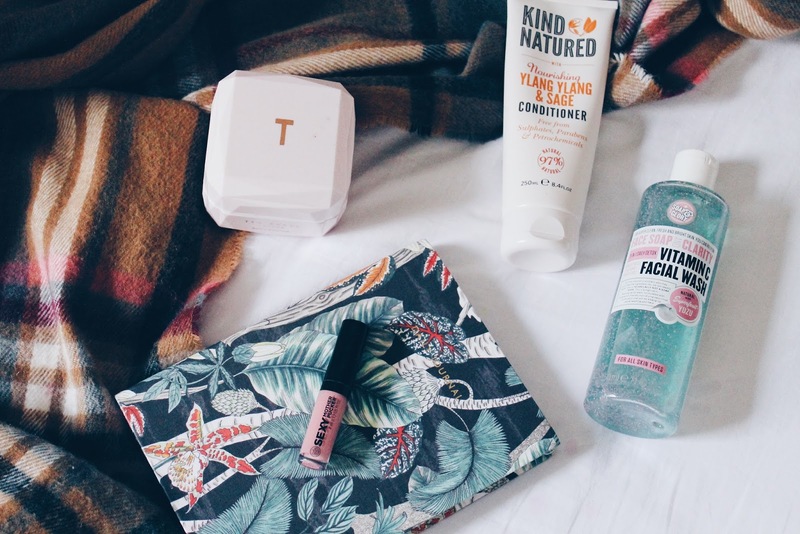 I've talked about this further over on my "CRUELTY-FREE SKINCARE FAVOURITES". It's been a month since I've started using this and I've still got a lot left in the bottle; it was definitely worth the money. Since moving to York for Uni, my hair has struggled to adjust the slightly harder water. However, since finding this conditioner in Boots, the hair problems have been limited. It does what it says on the tin and really nourishes my hair. It's a product with a real organic feel, whether that's the natural smell of Ylang Ylang & Sage. While the scent isn't for everyone, I've really grown to love it and the formula doesn't need any chemicals to help it work wonders. My Haircare routine is now completely cruelty-free; look forward to seeing that soon! What have you been loving this month? How was your January? !